We all want to be likeable parents who are nice, patient and compassionate. However, oftentimes in our quest to have our kids like us, we become pushovers, catering to their every want — whether it’s a good idea or not. Patience, especially, can become a tricky quality to navigate. While it’s considered a virtue to have patience, it doesn’t mean that a loss in patience makes you any less of a person. On the contrary, there are definitely types of behavior that warrant less patience and a firmer hand. Unfortunately for most of us, there is a thin line between being patient and a pushover, much of which depends on boundaries, comfort level and understanding of your child’s needs. Most of us wish to give our children what we didn’t have. Sometimes this urge to fulfill all their desires ends up backfiring on us as they become spoiled and just want more and more. Saying no to them is a reminder that you have the power. When you say no, you are setting a boundary, which then has to be enforced. It may seem uncomfortable at first, especially if you are a non-confrontational person or people pleaser, but it will get easier. 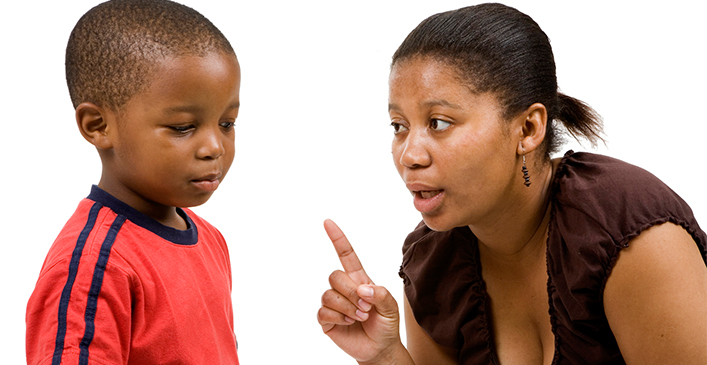 When saying no to your child, resist the urge to explain yourself. They do not need to know your reasoning or every thought. Children will often ask why or why not, not just to understand, but in order to come up with their own counter-argument. Have patience, but be firm and immovable in your ‘no’ and they will eventually come to accept, and respect, your decision. Whenever your child, or anyone else for that matter, goes too far or asks too much of you, it’s important to communicate your feelings on the matter. It’s one thing to have patience, but quite another to just give in to them because it’s easier for you. If you ignore your own feelings, it will eventually get more difficult for you to communicate exactly what they are. Instead, tell your child how their behavior is making you feel and why it is inappropriate for the situation. Children, like everyone else, just want to be loved. It’s an especially powerful driving force at a young age. They also have more empathy than we give them credit for. If they think they are hurting mommy’s feelings, they will think twice before acting out again. Children love to test their parents and see how far they can push or how much they can get away with. Unless you punish bad behavior, they will think it’s okay to continue what they’re doing. In some instances it’s fine to have a little patience while the child adjusts to the rule, but there still needs to be a punishment for breaking it. If you create a rule or impose a restriction on your child, there has to be a follow through. Consistency is needed for self-discipline and in order for them to respect you and your authority over them. If you are too patient with a child’s bad behavior and don’t reinforce punishments, you’ve crossed over into pushover territory. This is especially detrimental when your spouse does the opposite and is the strict enforcer of rules. Your child will know the difference and immediately come to you because they know they can bend the rules. To avoid the good cop/bad cop scenario, get on the same page as your spouse. Come to an agreement about about what you will and won’t allow, and what punishments are appropriate for the bad behavior based on your child’s age. Not only will you avoid further drama with your child feeling like he or she can take advantage, you’ll prevent the inevitable fights that will ensue from the breakdown in discipline. Ultimately, patience can only take you so far with a child or anyone else for that matter. There are two types of people in the world, the givers and the takers. Children are, for the most part, takers, and will continue to take as much as they are allowed to. With a firm, loving hand, you can guide them to becoming more of a giver while gaining more confidence in yourself and your parenting decisions. When Should Your Significant Other Meet Your Kids?